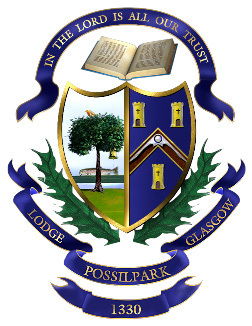 This Web Site ("Web Site") is owned and operated by the Lodge Possilpark 1330, hereinafter referred to as the lodge. All references on this Web Site to information, materials and services apply to information, materials and services available in the UK only, unless otherwise stated. Unless otherwise indicated, this Web Site is for information purposes only. None of the information and material on this Web Site should be construed as offering legal advice and specific legal advice is recommended before acting on any matter discussed or published on this Web Site. Unless otherwise indicated, this Web Site and its design, text, content, selection and arrangement of elements, organisation, graphics, design, compilation, magnetic translation, digital conversion and other matters ("proprietary rights") related to this Web Site are protected under applicable copyrights, trademarks and other proprietary (including, but not limited to, intellectual property) rights and are the property of Lodge Possilpark 1330 or the material is included with the permission of the rights owner and is protected pursuant to copyright and trademark laws. ALL RIGHTS RESERVED. Lodge Possilpark 1330 name and its logo, all product names, all page headers, all custom graphics, all button icons, all trademarks, service marks and logos appearing on this Web Site, unless otherwise noted, are trademarks (whether registered or unregistered) of Lodge Possilpark 1330 (the "Marks"). All other trademarks, product names, company names, logos and trademarks mentioned, displayed, cited or otherwise indicated on the Web Site are the property of their respective owners. You agree not to display or use the Marks in any manner without our prior written permission. You agree not to display or use trademarks, product names, company names, logos, service marks and/or trade dress of other owners without the prior written permission of such owners. The use or misuse of the Marks or other trademarks, product names, company names, logos, service marks and/or trade dress or any other materials contained herein, except as permitted herein, is expressly prohibited. This Web Site may contain links to web sites maintained by unrelated companies and persons. A link to another web site does not mean that Lodge Possilpark 1330 approves, endorses or accepts any responsibility for that web site, its content or use, or the use of products and services made available through such web site. Any link to this Web Site without our written permission is prohibited. Persons providing access to this Web Site via links from another web site are solely responsible for the content, accuracy, opinions expressed, privacy policies, products or services of, or available through, the source web site and for any representations made or impressions created concerning Lodge Possilpark 1330. Authorisation by us to link to this Web Site is given without assumption of any liability by us relating to such links, and we hereby disclaim any such liability. We reserve the right to withdraw any authorisation to link to this Web Site at any time and for any reason. To the fullest extent permitted by applicable laws we, on behalf of our employees and volunteers exclude liability for any losses and expenses of whatever nature and howsoever arising including, without limitation, any direct, indirect, special, punitive, or consequential damages, loss of use, loss of data, loss caused by a virus, loss of income or profit, loss of or damage to property, claims of third parties, or other losses of any kind or character, even if we have been advised of the possibility of such damages or losses, arising out of or in connection with the use of this Web Site or any web site with which it is linked. You assume total responsibility for establishing such procedures for data back up and virus checking as you consider necessary. Price and availability of information, materials, products and/or services is subject to change without notice. You agree that the courts of Scotland shall have exclusive jurisdiction to resolve any controversy or claim of whatever nature arising out of or relating to use of this Web Site, and that the laws of Scotland shall govern such dispute or claim. However, we retain the right to bring legal proceedings in any jurisdiction where we believe that infringement of this agreement is taking place or originating. Freemasonry is one of the world's oldest secular fraternal societies and which originated in Scotland. Freemasonry is a society of men concerned with moral and spiritual values. Its members are taught its precepts by a series of ritual dramas. These remain substantially the same form used in Scottish stonemasons lodges, and use Scottish stonemasons' customs and tools as allegorical guides. 83/85 Bardowie Street, Possilpark, Glasgow, G22 5ET. Copyright © 2016 Lodge Possilpark 1330. All Rights Reserved.